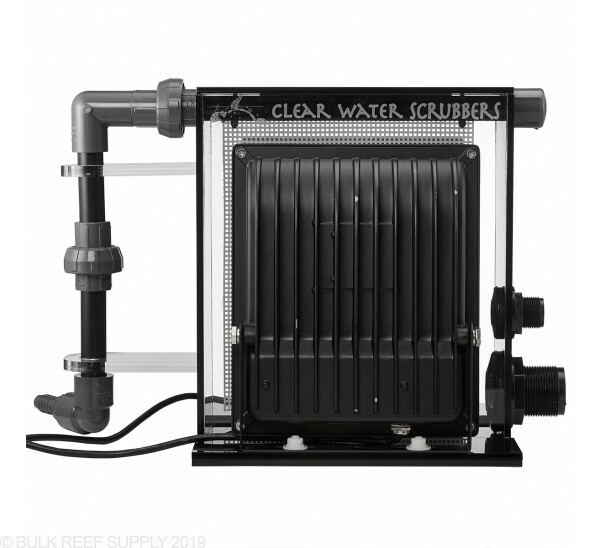 Solve your nutrient & algae issues with an Algae Turf Scrubber from Clear Water Scrubbers. Algae scrubbers can save you money and time with the minimal maintenance and energy usage. 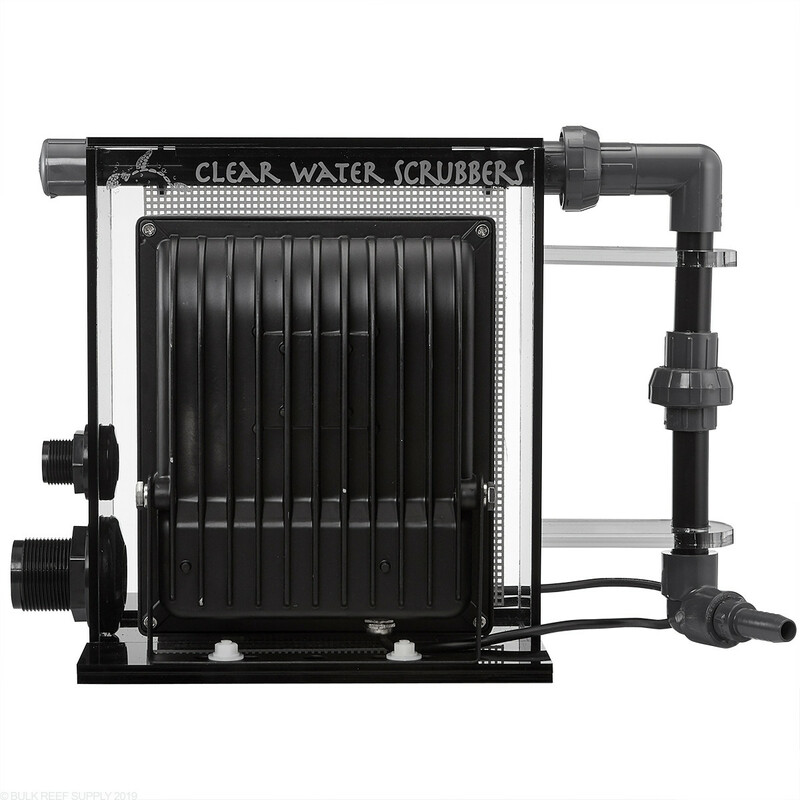 Clear Water Scrubbers are an external design that needs to be mounted higher than the sump of your tank for the drain to flow into. 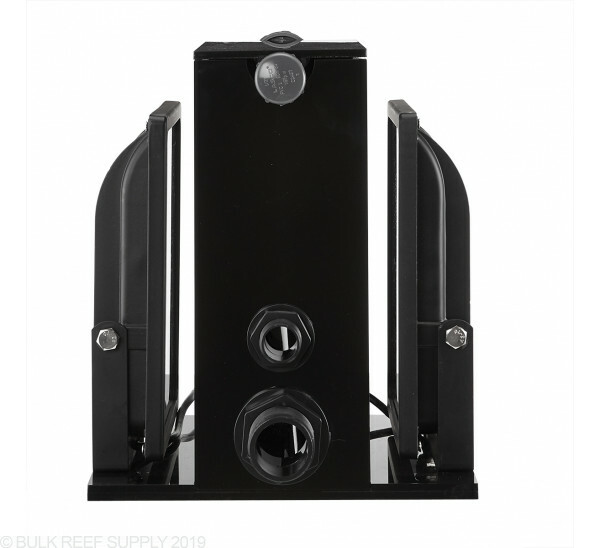 The feed for the scrubber can be done with a stand-alone feed pump, manifold, or through the drain of your aquarium and plumbed into the included 1/2" barb fitting. 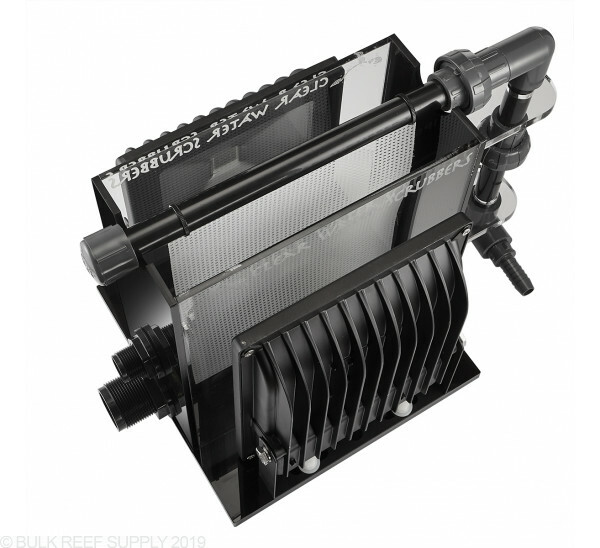 Water will then flow over the algae screen that is blasted with high power red/blue LED lights that encourage algae growth and then the water will flow into the main drain fitting and down into your sump. 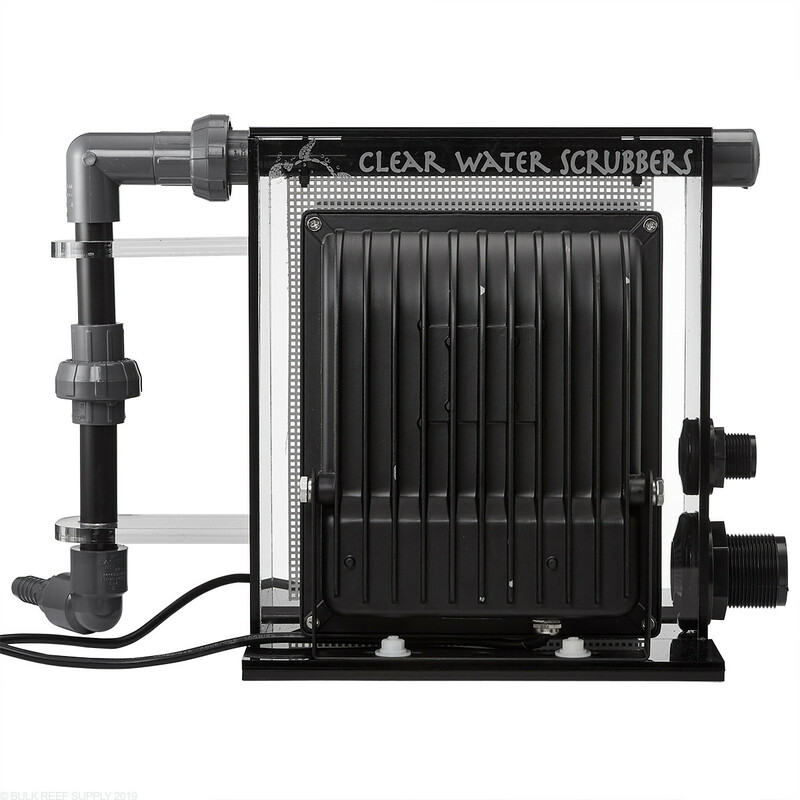 Clear Water's scrubber was designed with a 1/2" emergency drain fitting that will accept any excess flow if the 1" main drain ever gets clogged with algae. Maintaining the scrubber only takes a few minutes every one to three weeks to harvest the algae that has grown on the screen. By removing the horizontal union and rinsing the screen under a faucet will help knock a majority of the algae off the screen to be disposed of. Removing all the algae from the screen will lead to a slow start of the next batch and by leaving a small amount of algae on the screen you will help seed the next batch allowing it to grow faster. You may need to use a soft bristle brush (toothbrushes work great) to clean the slot that the screen fits into every now and then also. 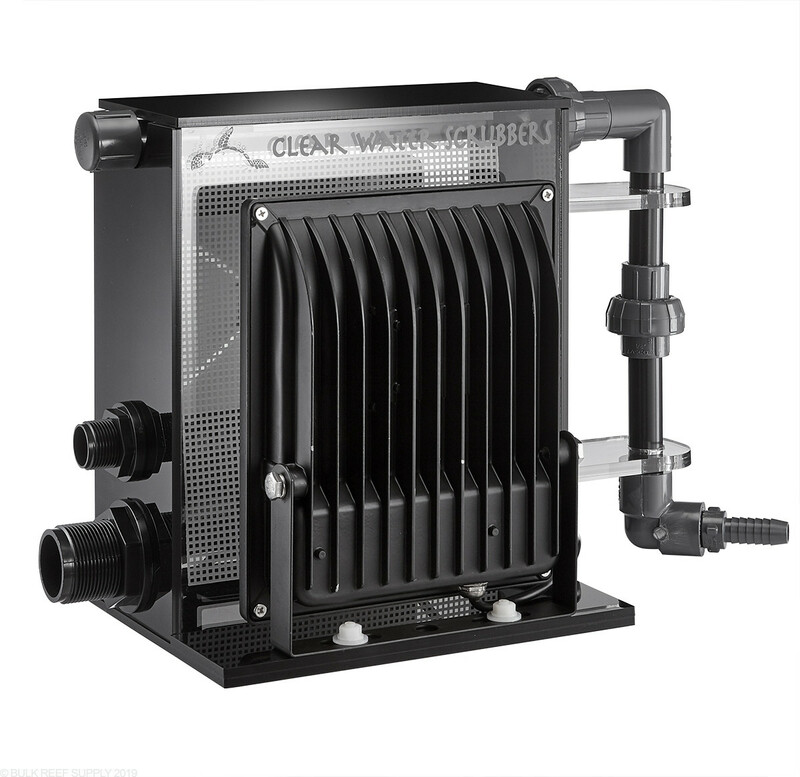 Screen Dimensions - 9 3/4" x 8 1/4"
Input Barb Size - 1/2"
Main Drain Bulkhead - 1"
Emergency Drain Bulkhead - 1/2"
While we can provide tank sizing recommendations based on typical feeding habits, the best and most accurate way of sizing for an ATS is based on the amount of food fed each day, measured for ease here as cubes of food, regardless of the size of your aquarium. There should be 12 square inches of growing screen per cube or equivalent amount of food fed to the tank each day. Oversizing an algae scrubber does not necessarily mean that it will grow algae faster or be more efficient, and in some cases, we have found oversizing the scrubber too large, can lead to poor results. 1. 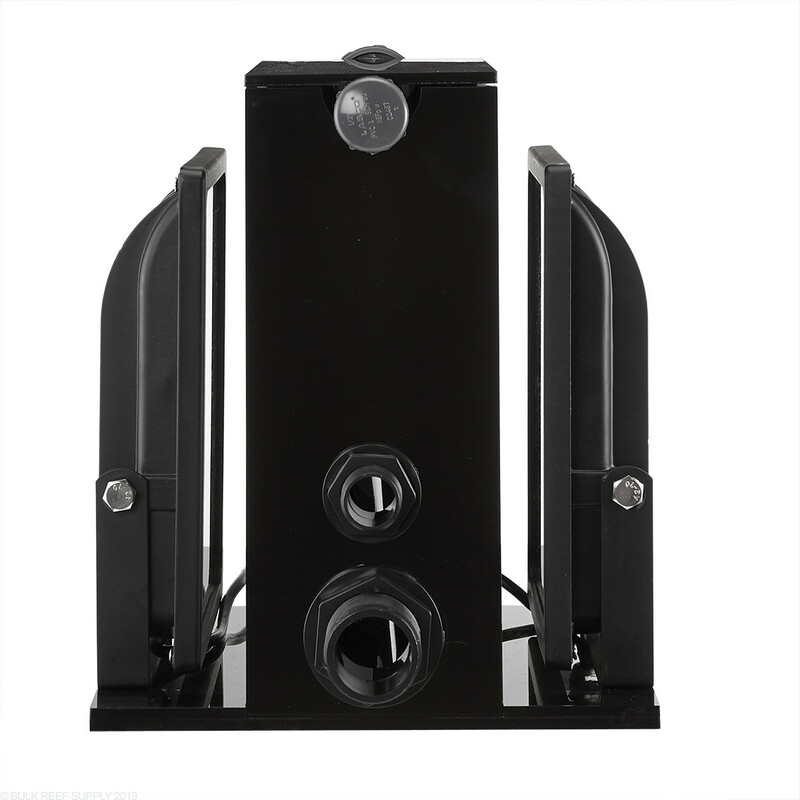 Find a suitable place for the scrubber to be placed that allows it to freely drain into your aquariums sump. 2. For best results remove the main and emergency drain bulkheads and install them in reverse (flange and gasket inside of the scrubber body). 3. Using 1" soft tubing or PVC plumb the drain into your sump. 4. Plumb the emergency drain with 1/2" PVC or soft tubing allowing it to drain into your sump. 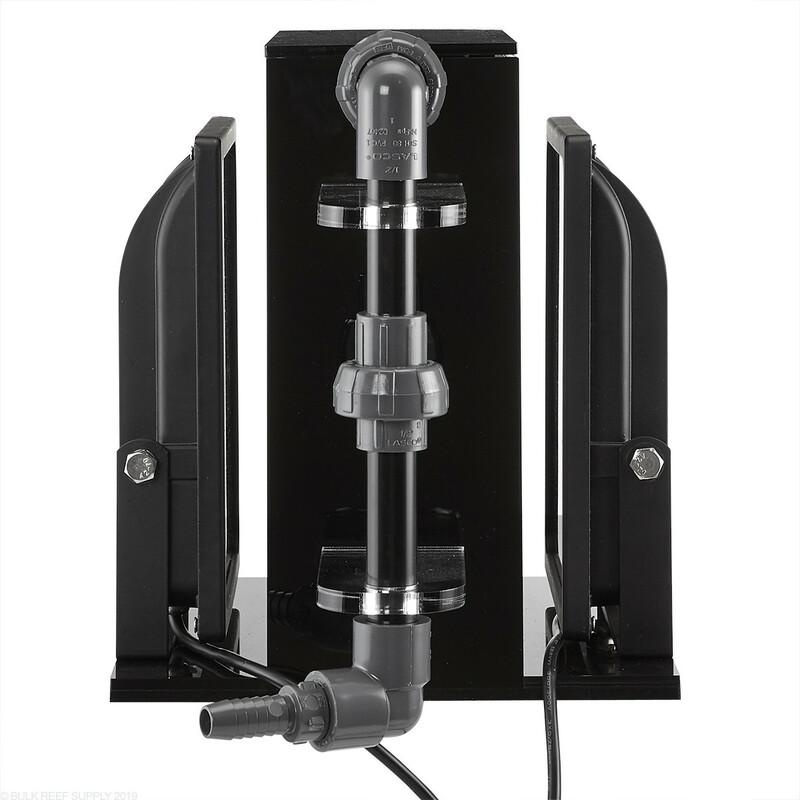 We prefer to keep the emergency drain a few inches over the water level making the water crash into the sump that produces an audible noise, letting you know when something is not correct with the main drain. 5. Attach 1/2" soft tubing to the included feed barb fitting. We really like using soft silicone tubing for this application. 6. Adjust the flow over the algae screen so that an even sheet of water flows down the screen. Flow adjustments can be made with either a ball valve on the feed line or with a DC style pump. 7. Plug the LED light power cord into a timer or aquarium controller and program it for a 12-hour daily photoperiod. We suggest illuminating the algae scrubber in an opposite lighting cycle than your display tank to help stabilize your aquarium pH. 8. Monitor the algae growth and after a few weeks, algae will be ready to harvest! 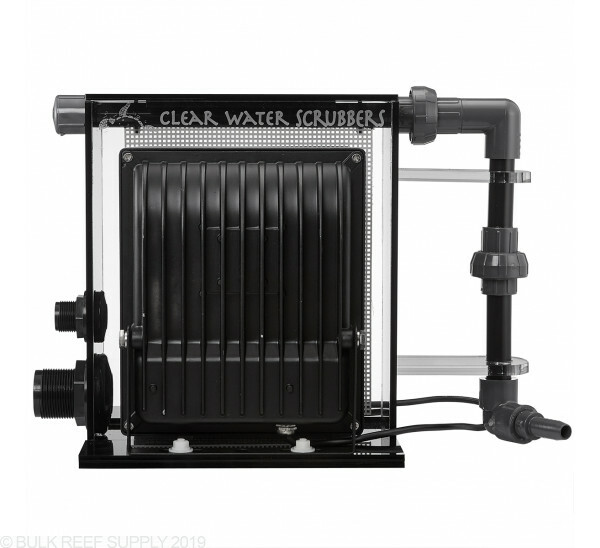 Note - For feeding the scrubber we prefer to use a stand-alone feed pump since they can be fine-tuned to the algae scrubbers needs. We really like to use DC pumps that let us control the flow rate through a controller or an AC pump with a ball valve. In a nutshell this works. I found out by trial and error that this is better than my kessil H380. I made a huge mistake by taking this off line to see if my chaetomorpha could keep up with my 240 gallon tank demand and sadly it couldn’t. Now that it’s back online it’s working wonders. Highly recommend. In a below review I rated it 4 stars, I am updating to 5 stars. I had a bad case of turf algae (worse than normal GHA), which would persist at near zero nutrients. I ran a lot of phosban and biopellets with no success (always testing near zero). Nothing worked until this scrubber. I installed this and 2 months later all algae in the display disappeared (all of it, no turf, nothing on the glass at all for weeks). Its big and expensive but worth it. Scrubber seems high quality. Simple to set up and plumb. Only complaint is plumbing in back going through acrylic supports seems to be a waste of space. It provides a high quality feel but takes up space unnecessarily especially when set up in a stand. My 220 gal acrylic is in the sun half the day then 2 kessels at night. Needless to say... acrylic algae has been a problem continuously. After seeing it in person at reef-a-palooza Orlando. I came home and purchased the algae scrubber 200 with the cover. It is fantastic. Algae started growing in the scrubber already and I can tell a dramatic difference in the tank growth. It was easy to install. BRS did not have the top cover included in the box. After contacting Algae scrubber direct, they sent me one out immediately. Now there is no light escaping and it is perfect. I would recommend it to anyone with an algae problem and now it is food source for my fish when I clean it..... Bonus!!!!! Supposedly, this device can replace a protein skimmer. 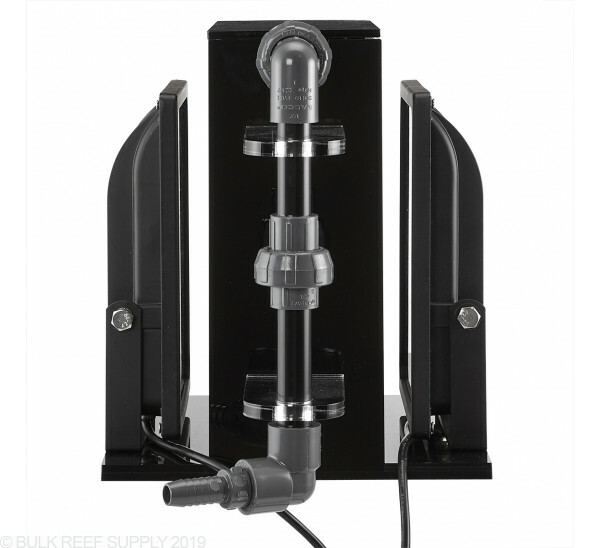 Since it's just water flowing through it, I figured it would be a great alternative for installations where noise is an issue, and purchased one to test out on my personal reef tank. First, I'm a bit dismayed by the overall build quality for the price. The whole thing looks and feels garage built. The central acrylic box is well made, but beyond that, it looks like something almost anyone could DIY. One of the areas that concerned me is that, using LED lights, once they burn out the unit will be either useless or potentially require expensive replacements. It uses LED flood lights. I can't tell what type or brand they are -- they're not stamped -- but very similar looking ones are available inexpensively. This is an area of concern for me; I've experimented with using similar LED lights over aquariums, and found that they often have a lifespan of under a year (sometimes considerably). Hopefully the ones in this are better, but time will tell. The big gap between the LEDs and the side of the acrylic box also mean significant light leakage -- they apparently sell shields, but you'll have to order them directly, and spend more money. If you can fit it inside a cabinet, this may not be a big deal (but see below). The bulkheads on mine were in backwards; if you don't want it to leak, you'll have to yank them out and replace them. It's a tight fit. Unfortunately, the "head" of the bulkhead is facing outward, and the gasket is on the outside (dry side). This is a surefire way to get a leak. This is opposite of how they're shown in the BRS pictures (which show the correct way). One big problem with the unit is that the /entire/ unit must be above the sump, and it's a foot tall. It drains from that 1" bulkhead, and this is a gravity drain. You have to be able to lift the lid off, and take the approximately 10" long sheet of needlepoint material (the algae screen) out. It's flexible, but you'll still need a few inches of clearance to do it without making a mess. 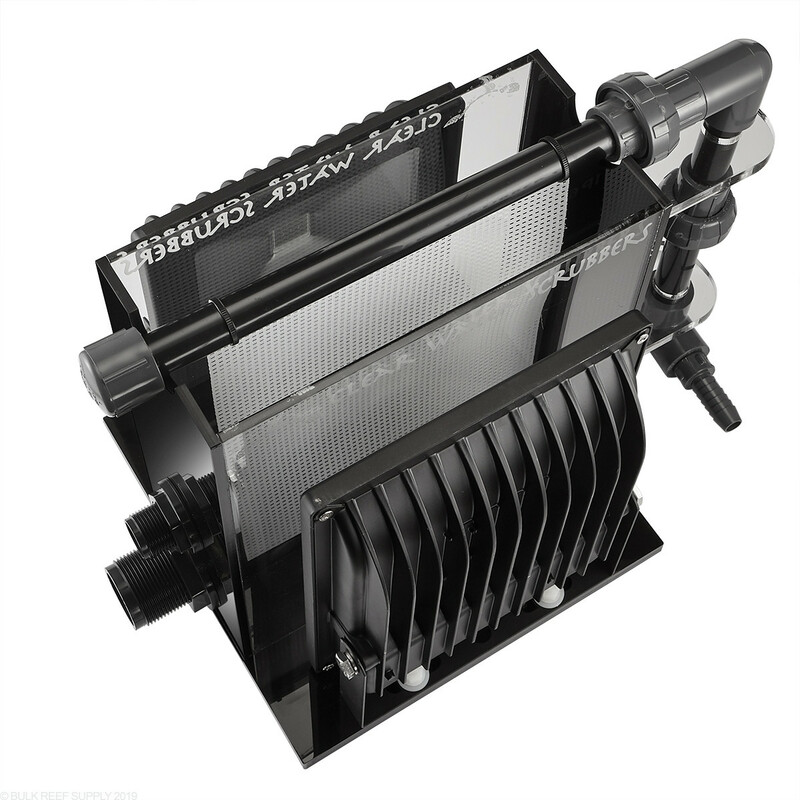 I don't have 16" above virtually any sump I own, and it will probably need more to get that in and out for regular service. You're going to have mix hard PVC and soft tubing. The input of it uses a hose barb, and I'm not sure how you could swap that to PVC without doing some serious modifications. The bulkheads on the drain side (one for the emergency drain, one for the standard) are schedule-40. You could get an adapter and do that with soft tubing, or just do it with PVC, but ... if you're not prepared to do a little PVC cutting and gluing (its easy), you're better off staying away. While I got the unit for noise control, water cascades out of the horizontal arm over the needlepoint mesh, and splashes into the standing half inch-ish of water. You're going to hear a /constant/ run of water. I don't know why BRS suggests cutting the emergency drain short so you'll hear water splashing ... put an elbow in it, raise it up toward the top a bit, and if the water running noise STOPS, you've got a problem. (That is a joke -- don't actually do that). The running water noise isn't bad -- it's only a couple hundred GPH -- but it was noticeable when I test ran mine. I like the concept, but it needs some refinement. If the whole thing was sealed with a gasketted top, like a canister filter, it could be located at almost any level, and that would solve a lot of my issue with it (though it means filling entirely with water). I’ve had this model for a few months now and I have to say that it works amazing. I wanted to try something new to keep my nutrients under control and this did the trick. I had no issues with the unit as far it spraying water from the top or any part being damaged. I have since removed my protein skimer and would highly recommend this for anybody wanting to use a natural method of controlling nutrients in their reef tank. Unfortunately, I have had to make modifications to this unit to stop it from spraying water and leaking from the top of the unit. It also dumps chunks of algae that get stuck in my return pump. I will say that the customer service from Clear Water Scrubbers is excellent as I was sent multiple replacement parts for free. Even with the new parts I had the same problem. Ultimately, I had to put rubber gaskets on the end of the top bar to stop water from spraying out the sides. I had to use the top lid (extra special order part) to stop spraying as well. I had to buy a tray and modify it so that when it leaks it collects and drains into the sump instead of on the floor. I had to run the exit water into a filter sock (more maintenance) to stop the loose algae from getting stuck in the return pump. I do have considerable growth each week, however nitrate and phosphate levels did not budge. The worst part is I now have green hair algae growing in my display tank. I think the large volume of hair algae in the system allows the easier spread to other areas of the system (as in the display tank). The maintenance on this unit far out weighs any other single part of my aquarium system. I wish I could return it since it does not do anything for me except waste my time. BRS was great too as they replaced my first unit that had the seems separating upon arrival. I am now using NO3PO4-x. So I purchased one of these bad boys and I had my doubts honestly. With a little research I looked up how to seed the screen, and have been sitting on a 16 hour light schedule. Opened my Red Sea Reefer 170 Sump compartment one day and what do you know, the screen is growing algae. Right now its just brown, but its working. My weekly tests for phosphates and nitrate are remaining at zero, so I can't complain. Still having trouble with a bit of algae growing in the display, but I assume once the algae takes off in the scrubber it'll disappear. Tyler over at BRS (whom I trust) told me about this unit and recommended it. I know that they just started to sell the unit and there are some issues with sales - but NOT the unit itself. Firstly - it comes nicely package BUT there is NO manual or material to explain what to do. OK - I'm new to the scrubbing scene and it should be expected that a lot of reef keepers are not going to know much about it. Anyway - I received it on a Friday and BRS was closed - so I tracked down JOSH - the manufacturer from Clear water and had a great conversation with him. He explained to me that they ARE putting a manual in each unit, but they hadn't done so yet and BRS was executed to get them out there. OK - fine. He told me they had a video on the BRS website - which there isn't as of yet. All and all - the bottom line is although it's expensive for what it is - it is very nicely made and I'm sure it's going to work awesome once all the installation kinks are worked out. The cons are: No manual = which will be corrected - No video up yet - which will be corrected AND the lights are so bright - you have be order and PURCHASE the light cover for another $30 from Clear Water. 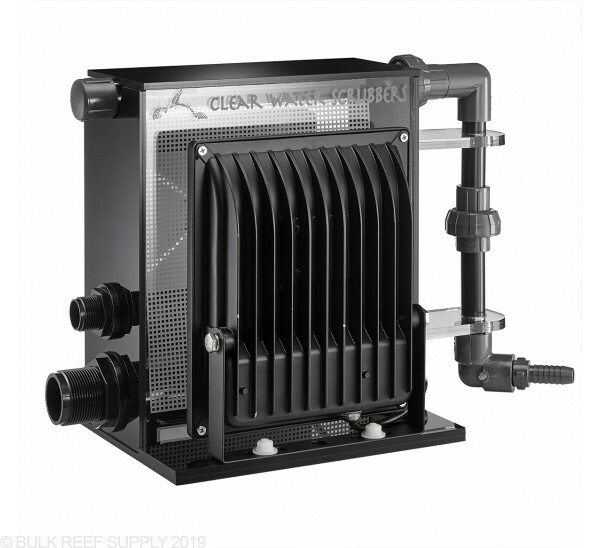 Personally - I think he cover should be included with the price of the unit as there couldn't be more than $100 worth of materials to make it but hey - I'm not a rich guy and just trying to do my reef right. Josh did explain to me that it would pay for itself within a year so here's hoping! Would it be necessary to have GFO & CARBON reactors to go along with an ATS? What about a Calcium Reactor? Algae turf scrubbers can be incredibly efficient at removing dissolved wastes from your water, and generally with a properly sized scrubber you shouldn't need to run gfo. Carbon on the other hand can have other benefits for water clarity and chemical removal, so this may not be dependent on the use of an ATS. A calcium reactor directly addresses calcium and alkalinity needs, and will have no real bearing on or interaction with the function of either an ATS or GFO and carbon, so I would examine this separately.